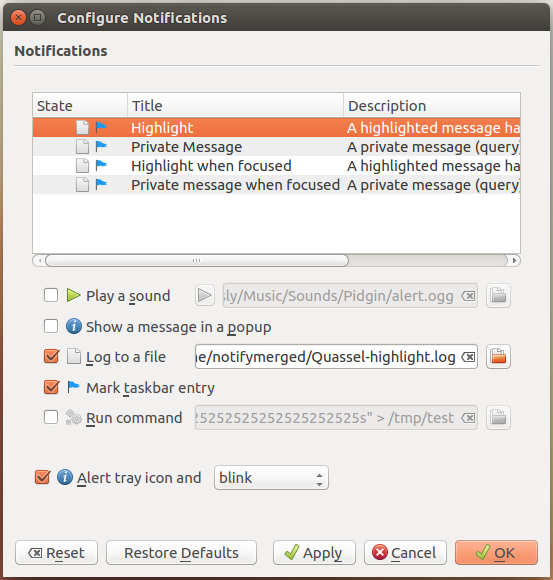 Separate notification channels for "Highlights" and "Private Messages"
Similar to the desktop Quassel client (at least with KNotification support), it'd be nice to configure Highlights and Private Messages separately. One use case is setting different sounds for each. Given the matter of Old Highlights, this might double the notification-related notification channels from 2 to 4, having Old Highlights and Old Private Messages. I'm not sure of a good way to handle this (other than push notifications so it's not needed in the first place). Aside, NotifyMerged is a simple C# app that monitors a directory for changes and emits notifications compatible with Canonical's x-canonical-append flag to enable message merging with their NotifyOSD framework.